Outgoing postcard US-3373216 to Taiwan shows a vintage card of George Washington's Surveying Office on the Washington Farm, located along the northern bank of the Rappahannock River, across from the city of Fredericksburg, in Stafford County, Virginia. 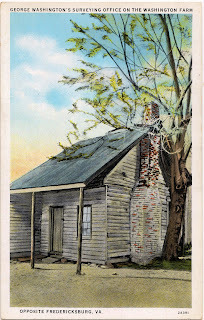 Also known as the Ferry Farm, it is the George Washington Boyhood Home Site where George Washington spent much of his childhood with the Cherry Tree Myth, and where his father Augustine Washington died on April 12, 1743 at age 49 when George Washington was 11 years old. Augustine had left behind a small set of surveying instruments after he died. 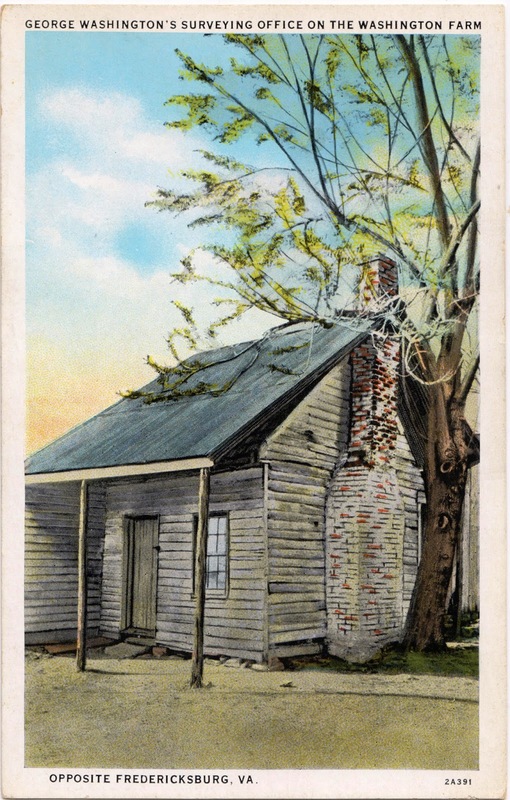 The illustration shows the only building remaining which is said to have been used by George Washington as a workshop while acquiring practice surveying. However, archaeologists later found the building dated to the late 1800s, post Civil War. So it could not have been used by young George as a workshop. "The Surveyor Shed" was a subject of money making schemes by James Beverly Colbert and George Allen England who promoted the non-important structure as a genuine relic, in an attempt to profit from the land's associations with Washington in the 1920s.